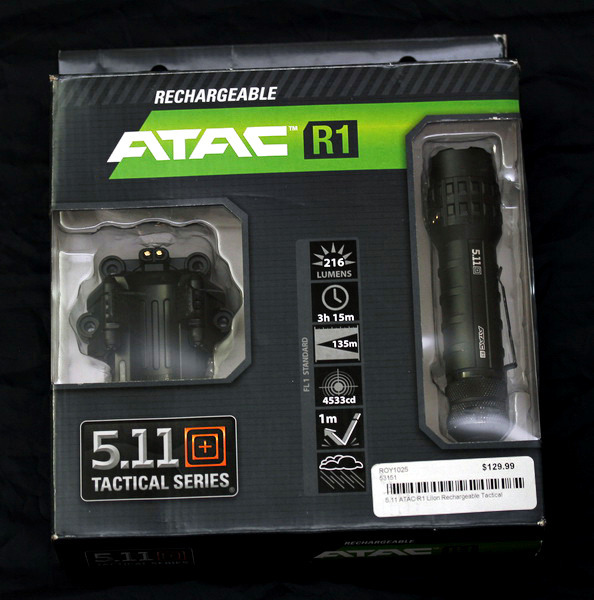 According to the 5.11 website the ATAC R1 is made out of Aerospace Grade Aluminum, does not say a specific grading of it, it comes in matte black finish. It comes with a whole slew of options, great for different applications. 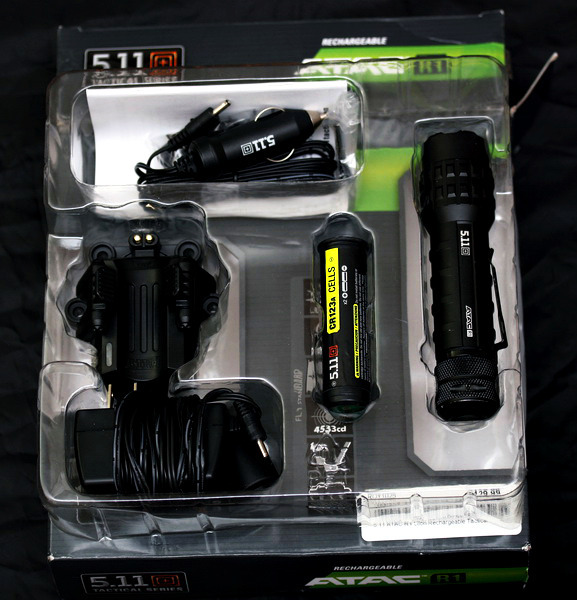 This light is $139.99 through 5.11, I paid $129.99 from Atlantic Tactical. I was issued a Streamlight Polystinger out of the academy and it was plastic, cheap, not bright and not sturdy. It broke several times and I had it warrantied, then it broke in a few pieces and I bought another one, this time it was their metal version. That broke finally so I was in the market for a flashlight, around April 2012. At that time this was "new" and I was in the market. I figured it was time to switch from Streamlight, and see if I had better luck with another brand. 5.11 has never been that awesome in my eyes, too much mutlicam and cheap molle gear. I looked at the "package" that this light came with, and I was happy with the assortment, size and quality of items. In the package you get the R1 rechargeable light, two battery packs. One battery pack lets you put two CR123a batteries (rechargeable or otherwise) and the other is an LiIon 18650 battery pack (which I kept inside the light at all times) which makes the light rechargeable. 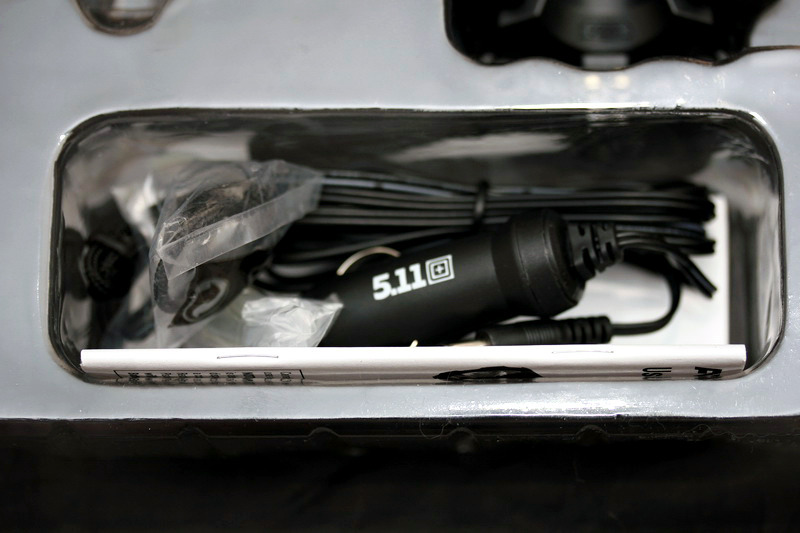 The package provides a standard wall charger, and a charging adapter with clamps that takes the flashlight which has a female connector to the male connector of the wall charger. 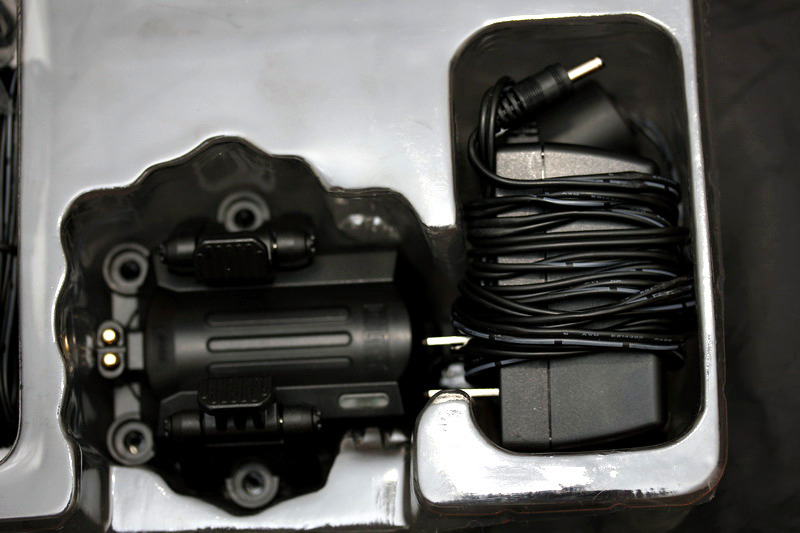 The vehicle charger also has a male connector and both chargers have about a 5 foot cord which gives a pretty good length for a charger. Inside the package a lanyard is included for use with the light (connected to the tail cap). There are some screws to use for the charging adapter, to attach to a wall or something of that sort. There are instructions, which are basically disclaimers and "how to" charge the light and what type of batteries to use. Not too bad of a package, not much you need that does not come with this light. Out of the box, the ATAC R1 is a pretty sturdy light, fits well in the hand and the bezel seems to have a good size to it. Definitely has a striking capability to it and can withstand hard impacts. 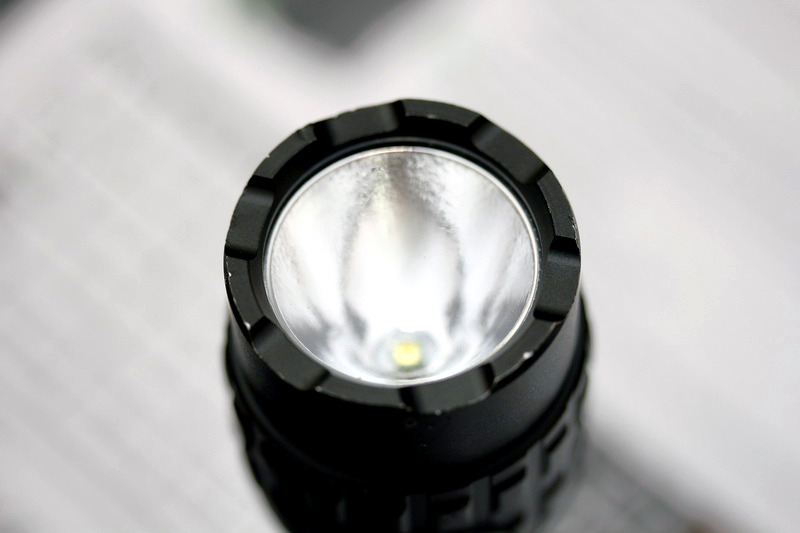 The light is powered by a Cree XP-G LED which provides an output of 216 lumens. It does not provide a pinpoint light spot, but a more "tactical" lighting spot, with a pretty good soft light spot around the center. Some refer to this as a "tactical" lighting setup, I do not care either way, but having it is better than not having it. The light did not, however, provide a "oh my god its so bright" light beam when shined in someones face, it did illuminate well, but nothing too serious. There are three modes to this light, a standard/high mode, a strobe at high and a low/reading/searching mode - which is about 20 or so lumens. The light comes with a clip, which is surprising well made for its size. I did not carry this light in a holster, I carried it clipped to my rear pocket for quick access. The clip connects to to a groove on the light body and does not move easily once the tail cap is screwed down tightly. The tail cap is pretty hefty. Definitely bigger than many tail caps I have seen on different lights. 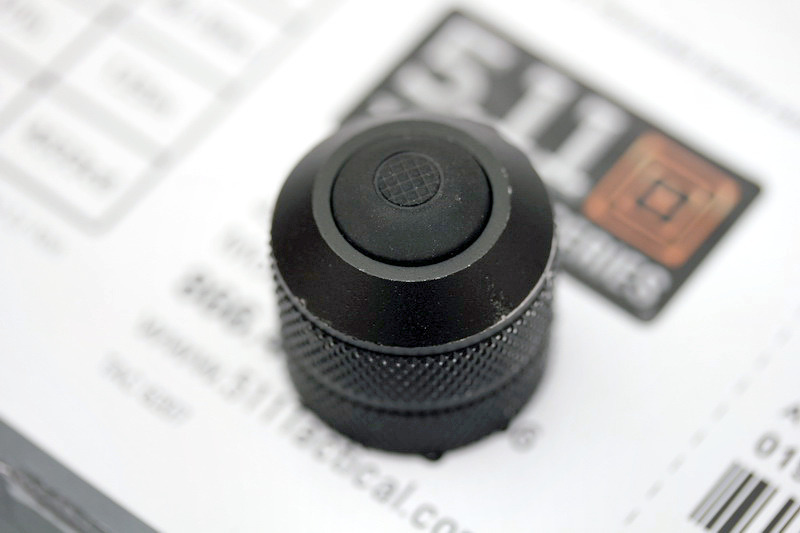 The button can he pressed down momentarily or clipped into place for constant ON and OFF. 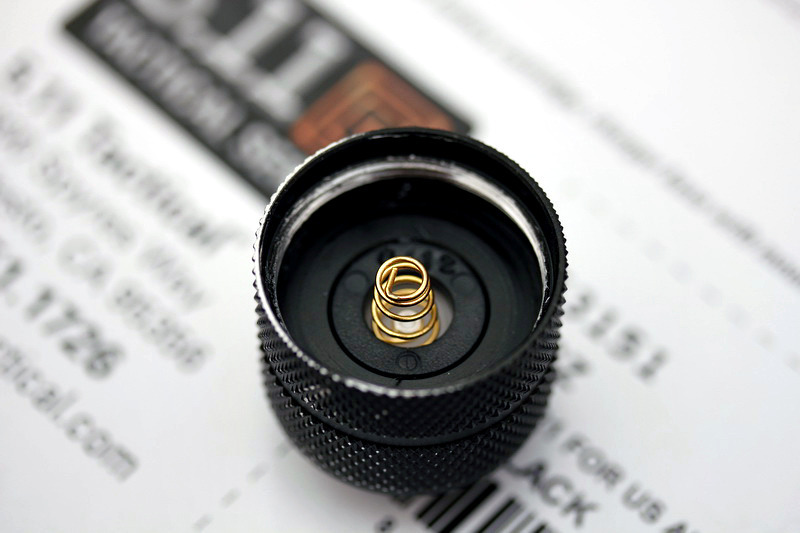 The light has gold plated connectors, which as you can see took a good bit of use and still look pretty clean and functional. The light body is thinner than the head and it all one solid piece. The only part that can be screwed off is the tail cap. It is pretty durable in terms of hard use, I have dropped it, used it as a hammer and have thrown it and as you can see from the photos there are very minor scratches on it. I carried this light everyday at work since I bought it (4/12) until last week. I used it in a variety of capacities from regular evening/night time property and vehicle illumination as well as inside structure searches and person illumination. The battery life is very good for such a small battery. I would charge it every three days, even with heavy use and it worked very well in terms of battery life. The clip is one point that I thought I would have to deal with during my use of the light. It was, to my surprise, a non-issue. It held shape very well and clipped to any pocket or gear that I attached it to. 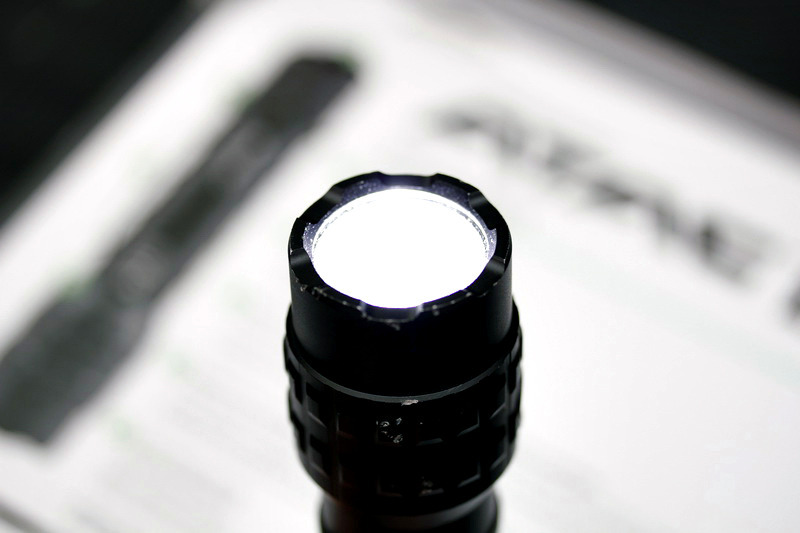 Though the light itself was not D-cell maglight size, it did handle its own in terms of size and ability to take abuse. The light gives positive momentary on and it does not slip into constant on easily, you have to forcefully click the button in order to have constant on. Switching the light between high/strobe/low is very easy and never presented a problem. The light was very easy to carry and was a relief to not have a bulky light on my rig for a change. It sat in my pocket like my EDC light does and I had no issues deploying or "reholstering" it at any time. The sub 216 lumen capacity was an issue for me, especially trying to gain compliance with light as well as light sourcing for vehicle-based operations. The light did not get hot during prolonged operation. When the battery is low the light turns for high to low and stays low, sort of an indicator and a way for the light to provide light even with low battery levels. 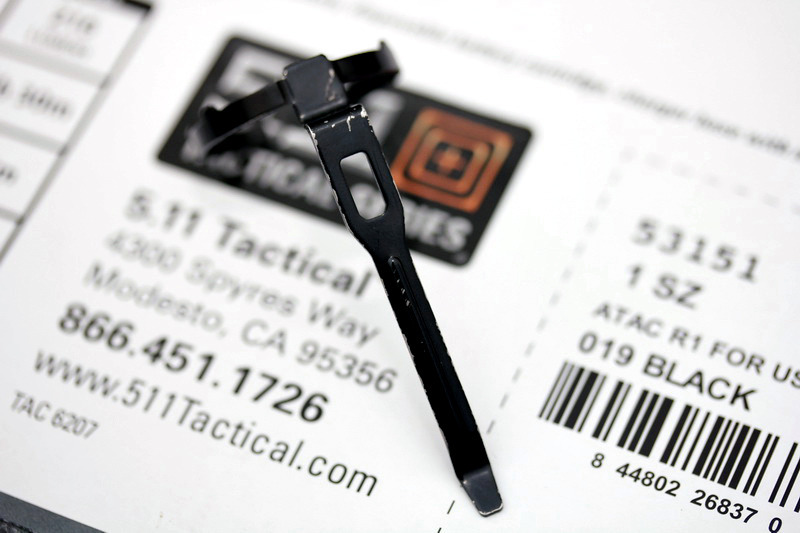 One part that I did not picture was a rubber retaining ring which would go around the top of the clip metal. It ripped and I lost it. It did nothing important anyway. The light is definitely water resistant, I have used it in the rain and had no issues with it, but I would not trust it in dropped in a puddle. At the price point of $129.99, at the current market it is too expensive of a light with not enough power/lumen behind it. If the light was $80 or even $75, it would be a no brainer, especially with all the cool accessories and charges you get. 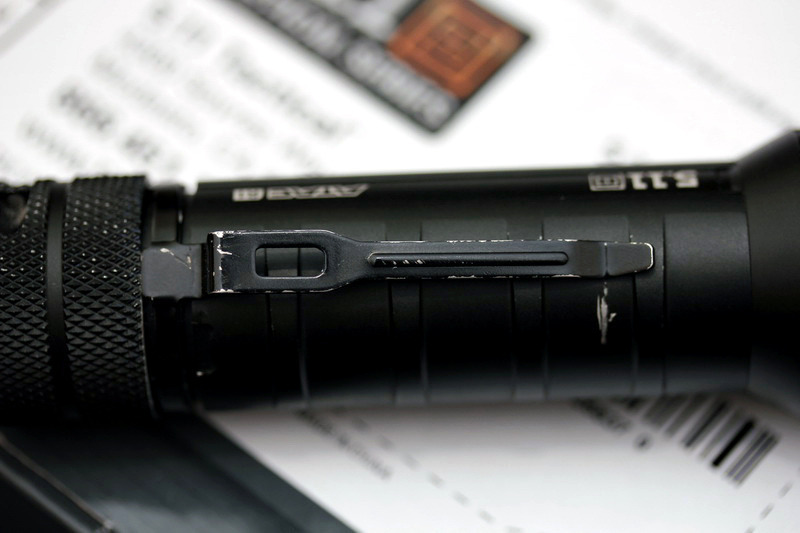 For an EDC light it is excellent, but again, there are better options out there. 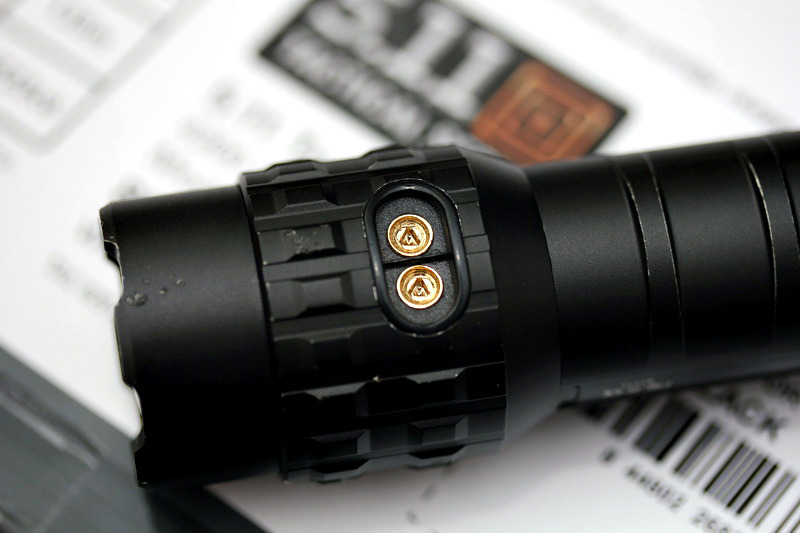 You are probably asking yourself what I got to replace it and the answer would be the Streamlight Stinger DS LED HL. I absolutely needed more lumen and the ability to throw the light beam further as well as having two buttons. 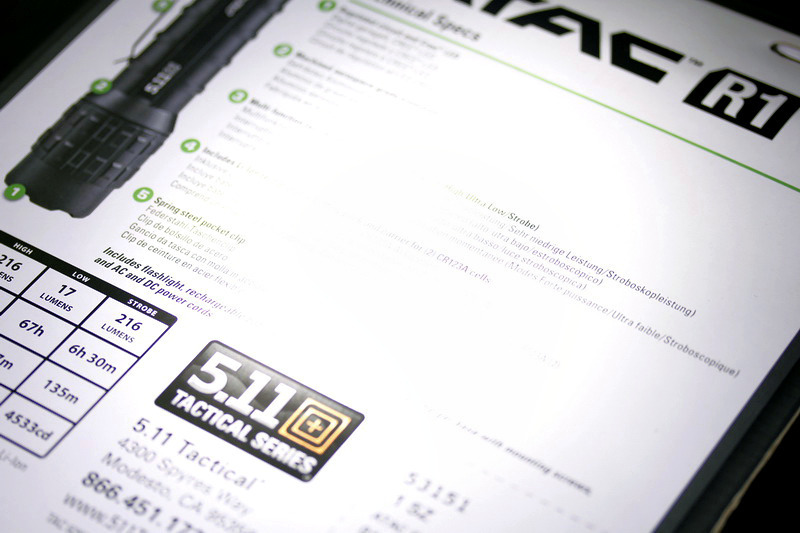 5.11 has some awesome lights and I would not write off their packages since their warranty is pretty good (and so is Streamlight's warranty). 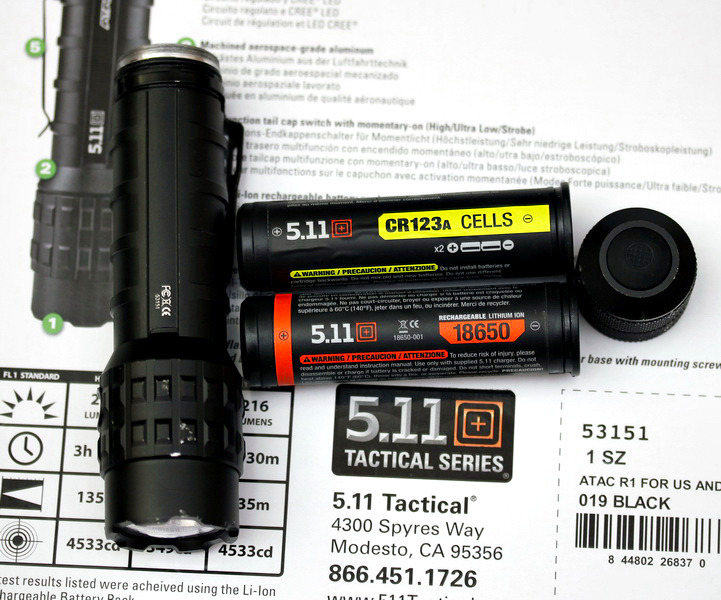 Check out the other 5.11 flashlights for more info, they are pretty interesting and definitely worth looking at. 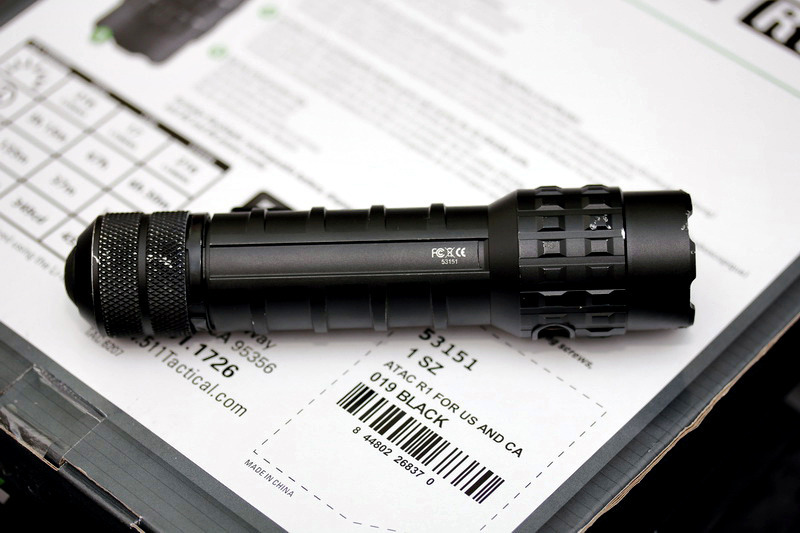 I would definitely compare the 5.11 lights to other companies like Fenix and Streamlight, specifically because there are a lot of excellent products out there and 5.11 is pretty new to the field. 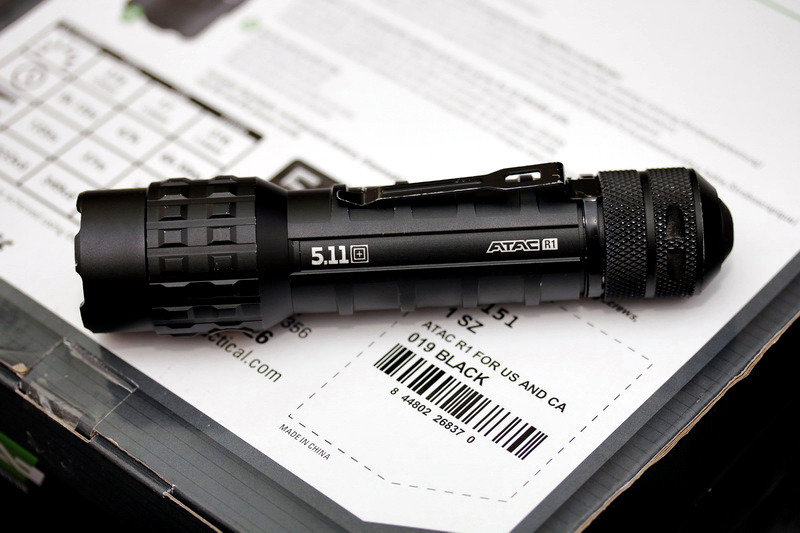 I do own another 5.11 flashlight, the ATAC A1 (review in link) and it is pretty good as well, though I do not carry it anymore. 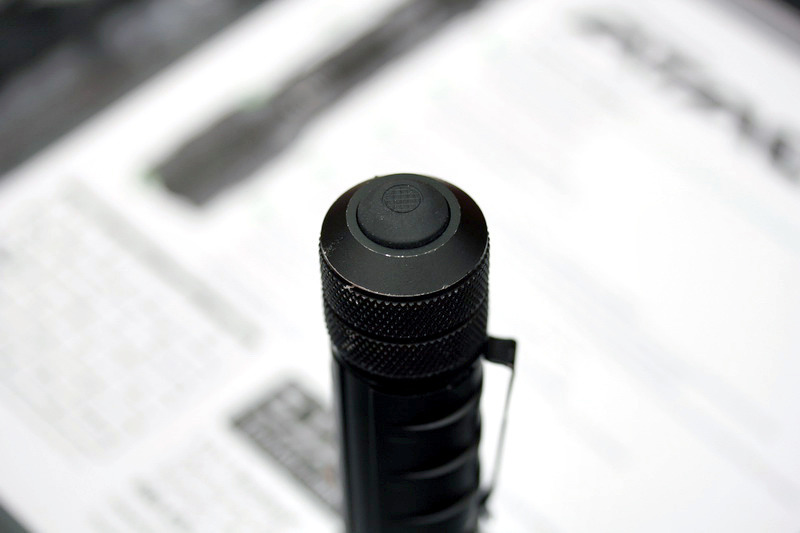 So if you are looking for a "duty" flashlight, look elsewhere, this one is not the right one for you. There are plenty of things that I wish this light did and then it would be a keeper, this light does not do them so I had to get a better application-specific light.